A new way to pay for your shopping. 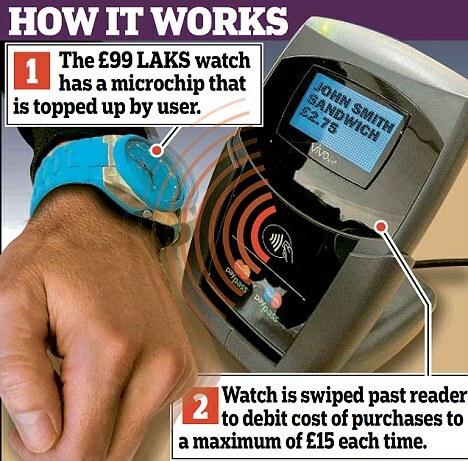 LAKS unveils a hi-tech watch to pay for purchases. Forgot your card? No need to worry as LAKS has launched a range of hi-tech watches that can be used to pay for small purchases. The ‘watch2pay’ gadgets work very much like Quick Tap technology, a system launched earlier this year that allows payments using mobile phones. Users can tap the watch on a special terminal at a till point at over 70,000 shops in the UK to pay for goods. A number of independent cafes and newsagents are involved in the scheme, as well as leading high-street retailers like Pret-A-Manger, Subway, McDonald’s and Oddbins. The watches contain a special chip similar to a mobile phone’s SIM card, which can be topped up with money online. This means that no money is ever debited from a customer’s bank account directly. MasterCard, which has teamed up with LAKS on the project, believes that this will help consumers to budget and prevent them from overspending without thinking. In the event that the watch is lost or stolen, a person’s account can be cancelled on the phone or online. The watches are available in a choice of eight colours and will cost £99 each.